This is not an important poisong in Angora goats and seldom causes losses. It can occur when Angoras are effected during times of drought and nutritional stress. Usually to be found on dry, stony hills. 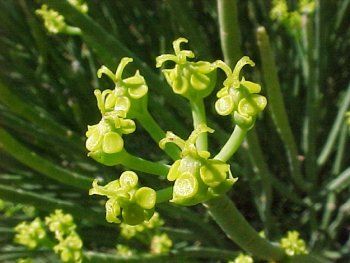 A succulent shrub up to 1 m high with many round, smooth, green branches containing white milky latex. Older branches with scattered leaf scars. Leaves entire, up to 1,3 cm long and only occur on young growing stems. 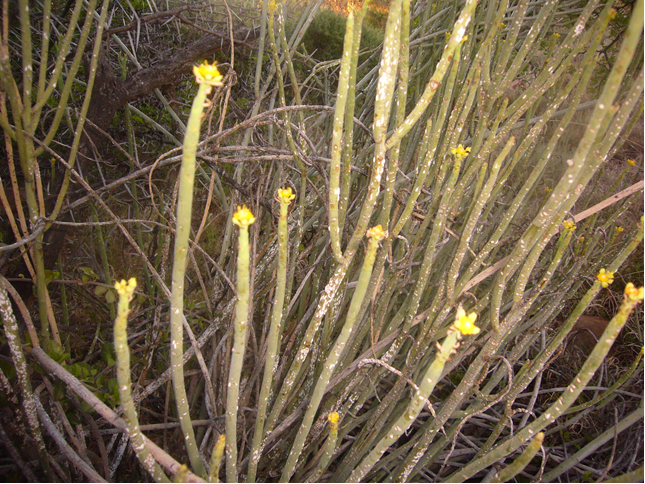 Yellow flower heads occur in groups at the tips of the branches. A 3-chambered capsule with a seed in each chamber forms the fruit. Similar signs to ‘Melktou’ poisoning but ‘Melktou’ induces tetanic spasms and ‘melkbos’ although legs extended can be flexed easily and diarrhoea occurs in ‘Melkbos’ poisoning.